This snail is happily hanging upside down from what looks like a mirror, but it’s actually the surface of the sea. The violet snail spends its adult life surfing from place to place on a bubble raft. Jacnthina janthina seems to go out of its way to make life difficult for itself. Not only has it picked an environment filled with salt, it has picked a part of that environment that is relatively barren of food. 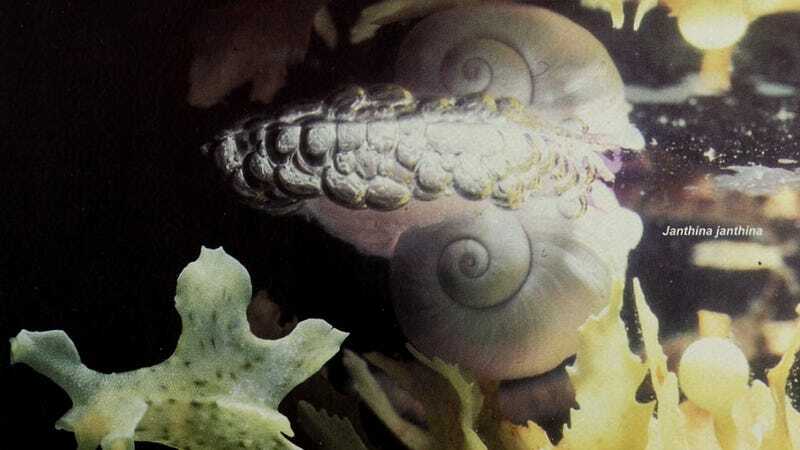 While it could be making its way along the debris near the shore line, the violet snail instead takes to the open ocean—specifically the surface of the ocean. There is only one problem. The stupid thing can’t swim. Not even a little. To be fair, the juveniles can swim a little. It’s only the babies and the adults that can’t swim. The adults have the ability to blow bubble rafts, reinforced with mucous, which hardens until they are fairly sturdy. The babies cling to those rafts. These snails are often found in big groups at sea, driven by the wind across the ocean in herds like upside-down floating bison. How exactly they find their food, steer towards it, or survive storms is anyone’s guess. What we do know is that they aren’t always lucky. Violet snails are among the animals that people in warm climates find on the beach. When the wind and the tide go the wrong way, it results in mass-strandings, after which the snails often can’t maneuver themselves back to sea again. Top Image: Avicennia Second Image: Rez242.